SLP Industries Ltd is pleased to submit to you an offering from our Steel Buildings division. 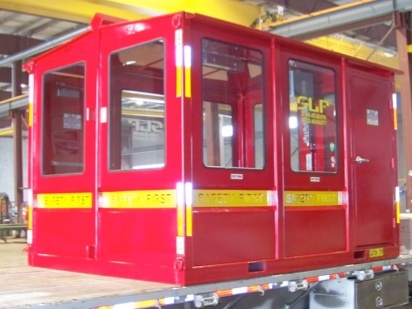 Tabled below a description of SLP Industries Ltd. patent pending, multi use buildings specifically designed and fabricated for use in the Oil & Gas, Commercial and Industrial Industries. These building were designed for camp and industrial situations whereby portable buildings are required. SLP Industries Ltd has received an outstanding response from some of the largest players in industry. SLP Industries Ltd is well informed and has extensive knowledge of environmental and safety issues facing companies today and can provide state of the art solutions to overcome these barriers. Combined with our experienced and talented team we can provide these solutions cost effectively and efficiently to Industry while maintaining a high standard of customer service. Based on our experience in the field, we are confident that we can meet and exceed your expectations. 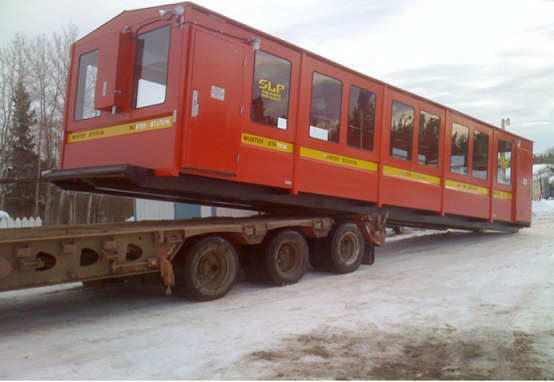 Our equipment meets or exceeds all Federal, Provincial and regulatory requirements. Our buildings are well ventilated and an all steel design to ensure there is no fire hazard. SLP Industries Ltd has designed and manufactured these buildings with four specific uses in mind. First Aid - Our buildings include an industry specific emergency First Aid Kit. Our solid bright red color and “SAFETY FIRST" incorporated right into the building itself tell everyone that this building is a safety and first aid station. First Response Spill and Emergency Station - Our buildings are stocked with Spill Kits and Fire Extinguishers. Muster Station - Our buildings are well lit, ventilated and have industrial grade heaters to protect visitors from harsh environments. These make our buildings a low cost solution to provide ample space and protection to do roll call or site meetings. 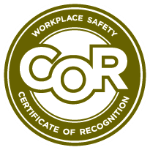 Smoke Shack - While SLP Industries Ltd. does not promote or endorse the use of tobacco products, we are cognizant that smoking areas need to be provided to protect the health, safety and environment for all site employees and visitors. Bus Station - This building was designed with the extreme Northern conditions in mind. 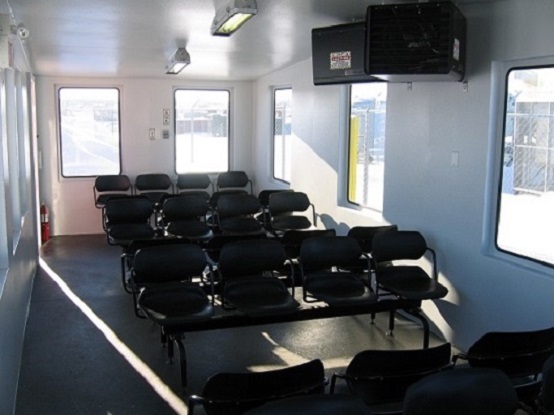 Insulated steel walls, heavy duty heaters, robust and durable finish, this station with its 32 chairs, ensures personnel will remain warm and dry while waiting for transportation. Custom Endura primed and painted SLP Industries Ltd uses its large steel purchasing power to keep the costs of our materials low. We use state of the art facilities to fabricate our products which allow us to offer a “best of breed” warranty program. We use only the very best products and services from start to finish. For more information regarding our products and services, please contact us via the contact information tabled below. We thank you for your interest and look forward to speaking with you soon. 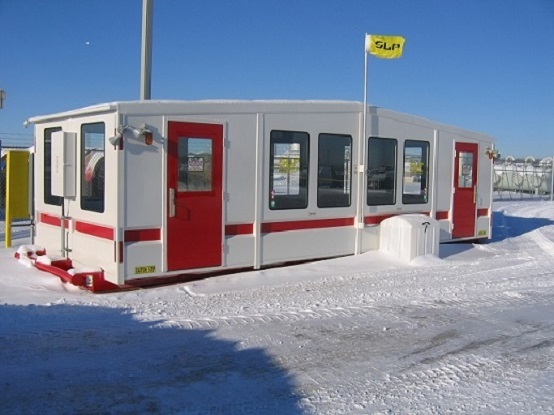 SLP's 10 x 30 bus station currently in use near Bonnyville, Alberta. Inside the warm and functional bus station. SLP's largest building, 10' x 40' Muster Building being loaded for delivery. 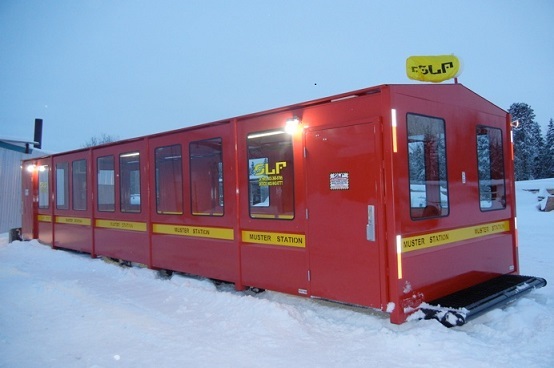 SLP's 10' x 40' Muster Station ready for shipment to Fort McMurray.